As the Chicago suburbs continue to sprawl westward, and the fields and forest preserves simultaneously shrink, wildlife has fewer places to live. Thus it is not rare to see a deer stranded in a backyard in Deerfield, or an elk stumbling onto a barbeque in Elk Grove. But it is still not common to see a coyote roaming the streets of Chicago, which is probably why officials had no clue on how to capture it when they pursued the clever critter this week. When our aforementioned coyote friend turned up in Chicago's Lincoln Park last week, more than a dozen calls came in from concerned citizens, and the city's Animal Care and Control team was forced to respond. "They really don't come near people, but for safety reasons we want to get him out of here," said AC&C officer Miguel Hernandez, soon proving the first part of the statement true himself. The day started with a promising opportunity as a local woman, armed with a steak and meatball dinner, lured the coyote out into the middle of the park's baseball diamonds and notified the pros, Animal Care and Control. Unfortunately when the Animal Van pulled up, the coyote sped off, finding shelter under a bush near the park's edge. At this point, Inspector Marstine Crayton, with a tranquilizer gun strapped to her back, jumped out and slowly stalked the shaded animal. But as soon as she got close enough to shoot, the coyote was off and running, crossing several busy city blocks and ending up in the beautifully manicured back yard of Cardinal Francis George's State Street mansion. Back in the van, the Animal Planet's version of the Keystone Cops pursued the wily one (with some eyewitnesses saying the coyote waited just long enough crossing Lake Shore Drive for the vehicle to catch up) with similar results. Marstine found the coyote lying down, but when she tried to shoot the animal, it first trotted back and forth between trees, then darted away—right back to the park. "This doesn't make sense," said park bystander Mahlon Canete, "they are trying to chase him down with a van," he chuckled, adding he thought the coyote was cute and would love to keep it. Actually there were three AC&C vans now in the hunt and they, along with several officers including Crayton pursuing on foot, closed in, seemingly pinning the coyote against the baseball backstop. But at the last possible moment the coyote again sprinted away, once more in the direction of the Cardinal's mansion—only to double back to the ball fields as the vans sped past. "I think the fox outfoxed them," said Frank Marktiz of the Chicago Park District. "This is totally pathetic," giggled Jennifer Graves, one of the growing number of coyote spectators. Indeed, by 2 p.m. there was such a large crowd of cops, construction workers, nuns and dog walkers watching the event unfold, that, as Crayton once again went to shoot the coyote (now back at George's place), the people began to worry about their own safety rather than the animal's. "She's probably gonna end up shooting someone else," heckled Ron Offermann to his construction crew, adding, "Maybe we'd better go inside!" "I have it in plain view!" Officer Hernandez cried, but just as he and Crayton went in for the "kill," their target vanished, and their boss, Animal Care and Control Director Anne Kent, finally told them to call this goof chase off. "Can you imagine if we shot someone?" Anne was overheard saying over the walkie-talkie of her disappointed underlings, who drove away for the day. 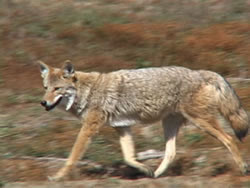 Sure enough, the coast now clear, the coyote emerged, and commenced to doze off in the middle of the Cardinal's yard. From this brief recap, FIT readers can certainly see many reasons, most of them metaphorical, why the average man (or woman) enjoyed this story. Whether it was the idea of the outmanned "underdog" outwitting a foe of superior numerical strength, or the psalm similarity of how one can still find refuge in the shepherd's pastures even when pursued by the enemy through the valley (or city) of Death, there is much for both Christian and non-Christian to relate to. Personally I couldn't help but think about the time when the world thought they had cornered and captured God Himself, only to find He had escaped the one trap, Death, which the devil thought to be foolproof, and in doing so freed mankind from the power of evil forever. I especially laughed at the idea that the coyote had so quickly and efficiently trained them to run to the Cardinal's place - by mere feint of a few yards - L-A-U-G-H! May the Golden-Domers in all sports have such luck with their playbook fakes, eh?